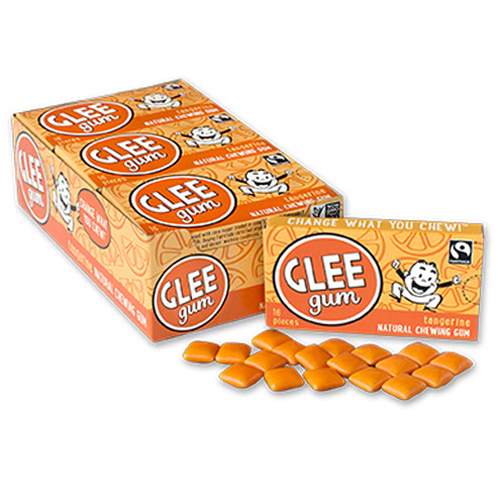 Pop a few squares of this citrus gum for an all-natural chewing experience. Contains sustainably harvested chicle from Central American rainforests. Please Note: Natural Candy Store is not responsible for melting or other damage caused by heat exposure during shipping. If it's hot out and your order contains chocolate, caramels, marshmallows, or gelatin-based gummies, there are steps you can take to reduce the risk of receiving candy soup! Please choose one of three options below to improve the chances your order arrives in great shape. Shipping may be delayed to protect your sweets. If necessary, your order will be held in our temperature-controlled warehouse to avoid additional transit time over the weekend. If you need a delivery by a specific date, please add a note at checkout or contact us so we can ensure your order arrives in time. Choose a delivery address where someone will be available to accept the package so it doesn't sit outside in the heat. Tip: If the box feels warm, open immediately to expose your sweets to cooler indoor air. If chocolate has softened at all, give it a chance to firm up again before handling further. Look up the current 10-day forecast for your location and the temperature high at our Natural Candy Store warehouse today/tomorrow (zip code 49684). If it's hotter than 75 degrees in either location, adding a cold box/cold pack and upgrading the shipping is recommended. Keep in mind your package may travel through areas much hotter than either location, weather forecasts can change, and delivery trucks may be 10° or more warmer than outside! Here are the estimated business days in transit (excluding weekends and holidays) via standard shipping options, from our warehouse in Northern Michigan to your location? These are estimates only... actual transit times will vary by each zip code, even within a state. 3. Add Cold Shipping Box and/or Cold Pack(s) to your order. 4. Choose an appropriate shipping method at checkout. Important: Cold packs are only effective for 24-48 hours, so if it's over 80°, they won't help protect your candy at your destination after 1-2 days transit time. Above 89°, Next Day delivery is recommended. Above 80°, 2 Day delivery is recommended. At lower temps or to save money, 3 Day can be a good option. Every order is different. It's possible your particular order will be just fine with standard shipping and one Cold Pack. So you should ask yourself, how important is it that your candy arrives in perfect condition? Do you need the candy to look pretty for a party or a gift? Or do you figure it's all just going to end up in your stomach anyway, so who cares? If you are less concerned about everything being perfect - or if you just want to save some $$ on shipping - you can always risk it! We will Provide Shipping Advice - Just Ask! To request personalized Warm Weather Shipping advice, please make a note on your order at checkout or contact us via email or call us with the destination zip code and your list of items and quantities (you might want to copy and paste the shopping cart into an email). 1. How heat sensitive are your items? While exposure to high temperatures affects all food products to some degree, most candy is relatively stable. Some types of candy can melt, including chocolate, caramels, marshmallows, and gelatin-based gummies. The product page of each heat-sensitive item includes a Warm Weather Shipping notice so you'll know which ones are at higher risk of melting. Chocolate is the most heat sensitive. Foil-wrapped chocolates and candy-coated chocolates are more sturdy and hold their shape better than other chocolate types. Candy-coated items may crack and become a little greasy after exposure to heat. Other chocolates may get soft and lose their shape even if they don't completely liquify. Note: Temperature fluctuations naturally cause chocolate to "bloom", where the cocoa butter separates resulting in changes in color and texture. Bloomed chocolate is still edible but may be less attractive. It often looks like it has a white coating, which is just the cocoa butter (and not mold!). Gummies made with gelatin will completely liquify in extreme heat (above 90°), re-solidifying when cool into a single bag-shaped gummy! Gummy-type candy made with pectin is not heat sensitive. It's easy to tell the difference, because the pectin candies are sugar-coated, while the gelatin-based gummies have a smooth surface. Marshmallows made with gelatin can melt together at very high temperatures. If you're using them for rice crispy treats, this may not be an issue! Caramels may get a little greasy or sticky after exposure to heat. At high temperatures they may even leak out of their wrappers a bit and change shape, but they will harden up again when cool and their flavor should still be good. EcoEggs - These biodegradable plastic Easter Eggs can be affected by heat and humidity. They may warp under warm, high humidity conditions. Other types of candy - hard candy and other sugar-based candy is generally fine to ship in hot weather. However, all candies will eventually become sticky if exposed to enough heat and humidity, so reducing time spent in transit is always recommended. 2. How much of the order is heat-sensitive? Candy Type - is it all chocolate, or is it mostly hard candy with only 1 small heat-sensitive item? Order Size - for example, a very small order may be more susceptible to the heat with its small mass, but it might not be worth it to take all the Warm Weather Shipping precautions. With a much bigger order you probably don't want to risk melting a large quantity of chocolate. Ingredients: Cane sugar, glucose, gum base (chicle, calcium carbonate, candelilla wax, dehydrated citrus peels), brown rice syrup, natural flavors, citric acid, gum arabic, resinous glaze, beta carotene, beeswax and carnauba wax. From the package: Soy present in facility. Additional information from the manufacturer: Does not contain any of the eight major allergens (peanuts, tree nuts, wheat, milk, egg, soy, fish, or shellfish/crustaceans). Soy is present in the manufacturing facility. Misc. info: Non-GMO Project Verified. Certified Fair Trade by Fairtrade International. Glucose is derived from tapioca. Gluten-free info: Contains no gluten ingredients. 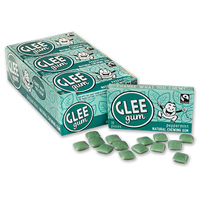 Additional information from the manufacturer: "Glee Gum contains no gluten. 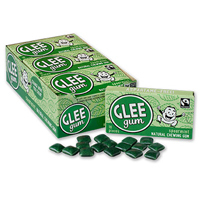 Glee Gum is safe for people with celiac disease and any other wheat and gluten intolerances." Vegetarian info: Not vegan due to beeswax and resinous glaze, but is vegetarian. Each box contains approximately 16 pieces. © Copyright 2019 Natural Candy Store. All Rights Reserved. Please note, Natural Candy Store offers manufacturers ingredient information, certifications and classifications (including these product icon definitions) to assist you to determine if a product is acceptable or not for your dietary needs and/or preferences. Only you can make that final determination. A complete ingredient list, along with any additional allergen or other information that we have obtained from the manufacturer, is included in the Ingredients Info below the picture of every product to help you decide if it meets your needs. For convenience, you may use the Shop By Diet feature to quickly narrow down the list of products available to those that meet your dietary needs and/or preferences. Natural Candy Store cannot guarantee the accuracy of the information provided to us by the manufacturer. We can only report what they print on their labels and what they tell us. Please read our Ingredients Disclaimer about the manufacturers information that we provide. Made with USDA Certified Organic ingredients. USDA Certified Organic foods are grown and processed according to federal guidelines addressing, among many factors, soil quality, animal raising practices, pest and weed control, and use of additives. Organic producers rely on natural substances and physical, mechanical, or biologically based farming methods to the fullest extent possible. Organic products are inherently non-GMO. NOTE: Any additional information we have will be included in the Ingredients Info on each product page. The VEGAN symbol indicates that the manufacturer claims the product contains no animal ingredients (no meat) nor any ingredients derived from animals (no dairy, no gelatin, no honey, no bone-char refined sugar nor any other ingredients known to be derived from animals). The VEGETARIAN symbol indicates the manufacturer claims the product contains no animal ingredients (no meat). A product claimed to be VEGETARIAN may contain dairy, eggs, gelatin, honey, bone-char refined sugar, or other ingredients known to be derived from animals. Genetically Modified Organism ingredients were made by use of a biotechnology technique called gene-splicing that combines the genes from different species, including plants, animals, bacteria and/or viruses. Certified Organic candy (organic is inherently non-GMO). The GLUTEN FREE symbol indicates the manufacturer claims the product is either Strict Gluten-Free OR Contains No Gluten Ingredients. has been confirmed to Natural Candy Store as gluten-free by the manufacturer. Contains No Gluten Ingredients products include only Gluten Free ingredients, but there may be a cross-contamination risk present during production, or for which the manufacturer has not confirmed if there is potential for cross-contamination. Use the Shop By Diets filter "Strict Gluten Free" if you have severe gluten sensitivity and are concerned about cross-contamination risk. Use the Shop By Diets filter "No Gluten Ingredients" to find products with a gluten-free ingredient list and you are less concerned about the cross-contamination risk. Has been confirmed kosher by the manufacturer. Has been confirmed Fair Trade by the manufacturer. The FEINGOLD ACCEPTED - STAGE 1 symbol indicates the product has been verified Feingold Accepted - Stage 1 by the Feingold Association of the United States. The FEINGOLD ACCEPTED - STAGE 2 symbol indicates the product has been verified Feingold Accepted - Stage 2 by the Feingold Association of the United States. The MADE IN USA symbol indicates the manufacturer claims the product or all of its ingredients were made in the United States of America.